Click photo to view it full-size in a new window. This female hairy woodpecker (Picoides villosus) found peanuts that the squirrels had hidden in a knot in the bird feeder tree. I made this collage in Photoshop Elements and I am not happy with the results. The photos go in order from left to right, top to bottom. I took these today. 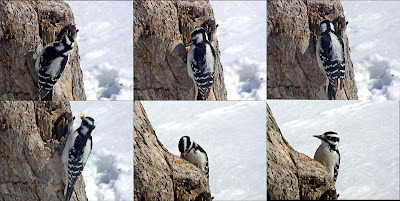 When my digital photography instructor saw my "downy woodpecker" photos, he told me, and another birder student confirmed, that all of my woodpeckers are hairys and not downys. My woodpeckers are a smidgin bigger than a robin. Downys are apparently the size of nuthatches. I will be correcting all of my tags, labels, and posts as time goes on. When clicked, this photo will open, full size, in a new window. Hairy woodpeckers??? I think I prefer downy or even feathery. However, I realised it's the type of woodpecker we're talking about here. Why aren't you happy with your photos? I think they're great...and the woodpecker doesn't care...he's more interested in his loot. Hope all is well in your world, Andree. What nice pictures ! We have one woodpecker here around I can hear it but never saw it ! I think those photos are gorgeous! Maybe his name is Harry. Do you think the "he" is a she?